A Dehumidifier is an appliance that acts much like an air conditioner, since it takes a flow of air and drops the temperature of this air, and as the temperature drops, the lower dew point of the air causes water to drop out. This is why a dehumidifier is continuously producing water. Some models will have reservoirs for the water which will need to be constantly emptied out, while others will be connected to drains where the water will flow continuously on its own. Dehumidifiers remove moisture from the air in your home, and are different than Room Humidifiers or Whole-House Humidifiers, which do just the opposite and add moisture to the air. 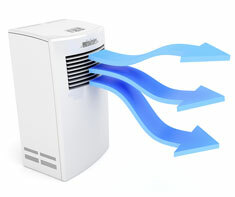 Dehumidifying the air makes a room feel more comfortable at the same temperature. Like air conditioners and refrigerators, dehumidifiers require a trained technician to work on the refrigeration components. Central Air Conditioning, Room Air Conditioner, Basement and Humidifier. Shown in the 'Routine Care' section are the recommended routine maintenance tasks for your dehumidifier. The 'Q & A' section shows answers to common questions. And the 'Articles' section provides helpful articles about your dehumidifier.